“Ah, music,” he said, wiping his eyes. “A magic beyond all we do here!” –J.K. Rowling, Harry Potter and the Sorcerer’s Stone. Preheat oven to 325 degrees F (165 degrees C). Place ham in a roasting pan (use aluminium foil in pan for easy clean-up). In a small saucepan, combine brown sugar, pineapple juice, honey, orange juice, orange zest, Dijon mustard, and ground cloves. Whisk together as you bring it to a boil; reduce heat, and simmer for 5 to 10 minutes. Set aside. 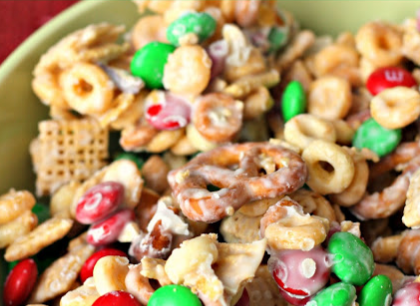 This is such a super yummy, colorful treat to share with your neighbors and friends at Christmas time. In a VERY large bowl (or two medium bowls), combine the first 5 ingredients. Set aside. In a microwave safe bowl, heat white chips and oil on high for 60 seconds (you could also melt chocolate and oil in a double boiler pan). Stir and microwave for another 30 seconds and stir until completely melted and smooth (you may need to microwave for a couple more seconds). Pour melted chocolate over cereal mix and stir until all the cereal is evenly covered with white chocolate. Spread cereal mix on 2 large cookie sheets lined with wax paper. Let cool and then break apart into chunks. Store in an air tight container. Serves 15-20 people. In large bowl of an electric mixer, combine water and dry milk powder, stirring until milk dissolves. Add yeast, then sugar, salt, butter, egg, and 2 cups of the flour. Mix on low speed until ingredients are wet. Increase mixer speed to medium and mix for 2 minutes. Add 2 cups flour; mix on low speed until ingredients are wet, then for 2 minutes at medium speed. (Dough will be getting stiff, and remaining flour may need to be mixed in by hand.) Add remaining flour, 1/2 cup at a time, and mix again until dough is soft, not overly sticky, and not stiff. (It is not necessary to use the entire amount of flour. )Scrape dough off sides of bowl and pour about one tablespoon of vegetable oil; work oil all around sides of bowl. Turn dough over in bowl so it is covered with oil. (This helps prevent dough from drying out.) Cover with plastic wrap and allow to rise in warm place until doubled in size, about 1 1/2 hours. Sprinkle cutting board or counter with flour and place dough on floured board. Roll out and shape as desired. Place on greased or parchment-lined baking pans. Cover lightly with plastic wrap. Let rise in warm place until rolls are doubled in size, about 1 to 1 1/2 hours. Bake at 375° F for 15 to 20 minutes or until browned. Brush with melted butter while hot. Serve with honey butter or raspberry honey butter. Makes 1 1/2 to 3 dozen rolls, depending on shape and size of rolls. Note: You can freeze shaped rolls for later use. Simply double the amount of yeast used when making dough. After the first rise, shape the rolls but do not rise again. Instead, place rolls on a baking sheet and immediately place in freezer. When dough is frozen solid, remove rolls from pan and place in a plastic bag, squeeze excess air out of bag and seal. Rolls can be frozen for 3 weeks. I got this recipe sweet-tasting cornbread recipe is from my friend Shauna, who got it here. Mix together the pumpkin, evaporated milk, sugar, eggs, salt, cinnamon and pumpkin pie spice in a bowl. Pour into a greased 9×13 pan. Then sprinkle the dry cake mix over the pumpkin mixture so that it is all covered by the cake mix. Spoon 1 cup of melted butter over the dry cake mix and then sprinkle the chopped nuts over all (if you like nuts). Bake at 350 degrees for 55 minutes. Good served warm or cold. This recipe is wonderful. We love it. However, please note: I always double the sweet potato mixture as written below to fill an 11×9-inch pan but I do NOT double the topping mixture as written below. By not doubling the topping, it is perfect for the doubled sweet potato mixture. Mix well and pour into casserole dish. Sprinkle with topping and bake at 350 degrees for 30 minutes. Serves 6. My sister-in-law Aud serves this yummy dish on Thanksgiving day. Dump cans of corn into your slow cooker. Stir in milk, sugar and pepper and combine well. Top with butter slices and cream cheese cubes but don’t stir it. Cover and cook on high heat for 2-3 hours. Uncover and stir until butter and cream cheese are well combined. Cover and cook on high heat for an additional 15 minutes. Serve immediately.